This year’s Thought Bubble festival was a little different for me in that I didn't have a table, or indeed any panel or signing duties, so in effect I was there as a regular punter, albeit on a bit of a busman’s holiday. And I have to admit that it was not only stress-free but more than just as much fun, if somewhat more tiring due to all the extra walking. With a third hall added and so much to see, it took me most of the weekend to visit all the exhibitors once – and many of those I had only the time for a cursory look. The quality and diversity of items on show was astounding, from self-publishing minicomic authors to growing British publishers of graphic novels like Blank Slate and Self Made Hero. There was a smattering of comic dealers and merchandisers, but the main emphasis as usual was on independent and alternative creators and publishers, artists and craft people. International guests this year read like a who’s who of independent comics and included the likes of Brandon Graham, Fábio Moon, Gabriel Bá, Matt Fraction, Geof Darrow, David Aja, Fiona Staples and Sean Gordon Murphy plus the usual vast number of domestic creators, almost none of whom I saw, let alone spoke to. Although I did have a brief chat with my old pal JeffreyBrown on his triumphant return to these shores. This year I opted to visit by train and therefore had the ideal excuse not to massively overspend as I did last year and so only collected a modest number of relatively lightweight pieces. For the many books I planned to buy at a later date I took a photo with my ageing-but-trusty 3GS as a handy reminder. Things that I did pick up included an example of Dan Berry’s delicate wash tones in his latest comic Carry Me, I finally caved in and bought the first volume of Kate Ashwin’s Widdershins and I celebrated news of Chelsea’s 3-0 away win at West Ham by buying a copy of fellow Blues fan Sean Azzopardi’s Trees sketchbook mini. I was also unable to resist Dave West’s latest tome Robot Shorts, an overdue purchase of Kate Brown’s Fish + Chocolate, Giant Days#2 from John Allison (who promptly returned my purchase money for my Movember fund), the latest Curia Regis from the multi-talented Robin Hoelzemann, the first comic by a fresh young creator Jack Devereaux, Next Stop Space and grabbled the new Verity Fair from wily old Terry Wiley. While waiting in line to congratulate Cameron Stewart on his superb Sin Titulo hardcover which I coincidentally had read a few weeks ago, I witnessed a truly generous, beautiful thing that Cameron did for a young fan (which I won’t detail here because it’s the sort of knowledge that could lead to him being taken advantage of in the future). At a time when some comics professionals are coming in for a lot of brickbats, it was a heart-warming gesture by a true gentleman. I must also say thanks to the immaculately groomed BrendenFletcher, co-writer of Assassin’s Creed : Brahman who kept me entertained while I waited for master brush wielder Becky Cloonan to return from a panel and sign my copy of her latest mini-comic Demeter. In addition, namechecks are due to those I had long and short chats with, including an old self-publishing contemporary Marc Laming, the always elegant and charming Yishan Li, demure Daryl Cunningham, con circuit stalwart Martin Eden, psychedelic Sally Anne Hickman, the appropriately attired Sarah McIntyre, dapper Woodrow Phoenix and cartoonist extraordinaire Roger Langridge. Such was the chaos, I barely acknowledged the ubiquitous Al Davison, Paul Rainey, Sean Phillips and Tim Perkins, had time only to punch Frazer Irving in the arm, and didn’t even get a chance to speak to David Lloyd at the Aces Weekly table. I also failed miserably to engage with Gary Northfield, Mark Buckingham, D’Israeli, Philippa Rice and sadly didn’t get to meet the extraordinary James E Snelling as intended. A big highlight was discovering the wordless comic Butterfly Gate, the latest from the creators of Porcelain, Ben Read and Chris Wildgoose, a previously unknown self-publishing creative team who have apparently emerged into the industry fully formed. They’re both charming guys and not satisfied with those two fantastic projects, were already giving away stunning previews of their next, Briar. My former how-to-draw-books collaborator James McKay was highly visible this year, giving away free copies of a book he conceived and edited with Ben Dickson, Dreams of a Low Carbon Future. A project created from the visions of hundreds of schoolchildren, PhD researchers and academics (from the University of Leeds and the Royal Academy of Engineering) and comics professionals and resulting in an amazingly coherent graphic novel. Impressive stuff. Another University science project giveaway was the newspaper format Asteroid Belter, put together by students at Newcastle Uni and includes a two-pager by the wonderful Nigel Auchterlounie. To my delight, awesome illustrator/cartoonist type Dean Beattie – from whom I bought a couple of prints from some while ago – has drawn and published his own comic Random Trials, which at first look seems to demonstrate that Dean has storytelling ability to go with his fantastic draughtsmanship. I almost missed meeting up with eternal pessimist Dave Hitchcock, but bumped into him while he was killing time before his train and got to see some of his spectacular original artwork, including some marvellous unpublished material and well as hearing about his latest disaster stories. It took some time to browse the impressive selection of translated French albums from Cinebook whose line keeps on growing year on year, and an affordably priced entry point into la bande dessinée for the English language reader, a publishing project that deserves to be fully supported by the entire alt/indy comics community. Graphic novel specialists Blank Slate, Nobrow and Self MadeHero continue to make a huge impression at the event, with a continuous medley of creators like Frederick Peeters, Glyn Dillon, David Hine, Mark Stafford and the ever-lovin’ Ilya, all signing European festival style; so many lovely new books, reluctantly none of which I bought due to my self-imposed weight restrictions. Base camp for the weekend was the shared exhibitor space of amiable Al Nolan (and his range of ‘gentle murder mysteries for kids’) and embroidery artist Bridgeen Gillespie (and her greatly admired hoops) who also were my con buddies out-of-hours. Better company for evening meals and pub drinks would be hard to find. It was terrific to just hang and chill with Pádraig ÓMéalóid and his lovely wife Deirdre Walsh in person, and to finally got to meet the charming Amber Moore after all these years - although I only had the briefest re-acquaintance with the Reppion-Moores, John and Leah. The place was positively awash with journalistic types - it was great to meet the man-mountain Gary Gray, the not-as-scary-as-you-might-think Laura Sneddon, Steve Morris of the Beat and the ever-youthful Matt Badham. I also bumped into Paul Gravett, complimented him on his new Comics Art book and asked him who Brian Moore was. I think my favourite innovation of the festival was the Tea Bubs Bar. A pop-up coffee house where you could give your weary legs a rest, relax and enjoy your refreshments, keep an eye on all of the three venues at the same time. I received a mid-tea-queue bear hug from Oscar Zarate when he finally recognised me without all that long hair. In fact I spent so long meeting people and perusing the exhibitors’ wares that I miserably failed to attend even a single panel or other daytime event, despite my earnest intention to do so this year. Note to organisers: there is simply too much to do and too little time in which to do it. Please create some sort of time-stasis field so we get a chance to enjoy everything properly. I did however enjoy the delights of the legendary Thought Bubble mid-convention party, once again held at the spectacularly-domed and multi-levelled Corn Exchange. Even with a vast Christmas tree on the dance floor and a DJ with an unfathomable playlist, it didn’t stop many of the attendees getting’ their freak on, while others queued for drinks and ate sausages. I also got a long overdue hug from that Swedish girl. A new hall for exhibitors had been added this year to satisfy the demand for tables after the initial number of slots sold out in two hours. In addition to the usual New Dock Hall (the big dark one) and Royal Armouries Hall (the smaller bright one), was the barely-ready-in-time Allied London Hall which housed the unlucky exhibitors who failed to make the initial cut. Haphazardly-placed fluorescent tubes and heaters, some sort of dust hanging in the air like a fine fog and a smell of aerosol paint (used to create some rather impressive comic-themed murals) created a slightly surreal, illicit atmosphere. Footfall seemed to be lesser than the other two well-established halls, although both those appeared somewhat busier than last year, especially on Sunday. In fact at peak times, parts of New Dock Hall were impassable, due to heavy interest in the big-name signings. The popular view is that more exhibitors (assuming the same number of attendees) mean less money spent at each table, making it difficult for those exhibitors to make a profit (I don’t know the numbers of attendees for his year). There are always winners and losers of course, but even the relative losers that I spoke to just seemed happy to be part of it all such was the positive vibe of the event. It’ll be interesting to see how Thought Bubble develops from here. I have no idea whether the new space is permanent, or whether the convention will revert to its original size next year. Certainly the overwhelming impression I got was yet another year of huge success and stellar achievement for Clark, Lisa and the army of redcoats, and you can put down the minor issues with Allied London Hall as a symptom of growing pains. With the recent establishment of the London Super Comic Con and the new Lakes Comic Art Festival in Kendal, is Thought Bubble still the best comic-related event in the UK? I suppose it depends on what it is you’re looking for exactly, but if it’s wide-ranging diversity of products, excellent organisation, a cool friendly vibe and Roller Derby girls as security that you want, then it’s no contest. From a punter’s viewpoint, it was pretty much the perfect comics event and I will find it hard to stay away in 2014. I suspect there will be a few thousand more feeling the same way. Book early. You can see some of my purchases from this year's Thought Bubble Festival on my experimental Tumblr blog Comicapaloozarama. This week Alan Moore celebrates his 60th birthday, and much of the comics community will be celebrating along with him. That means that it’s ten years since I published the English language edition of Alan Moore: Portrait of an Extraordinary Gentleman, a massive 350-page volume crammed with mostly-new birthday tributes of comics, illustrations and text pieces from 145 different creators, a collection edited by me and my Italian chum smoky man. My own contribution was a twelve-page comic strip collage, the similarly-titled “Alan Moore: An Extraordinary Gentleman,” a potted history of the Bard of Northampton’s life to date, intended to serve as both an extended introduction to the book, and to the subject of the book. Now, ten years on, “AlanMoore: An Extraordinary Gentleman” is finally getting published for the first time in full colour - not only that, it has been extensively updated, upgraded and corrected (with a great deal of thanks to Pádraig Ó Méalóid for that). Images have been replaced, errors have been fixed, panels have been re-sequenced and four pages’-worth of new material has been added. Unfortunately for Moore collectors though, this new publication will be exclusively available through SEQUENTIAL’s digital platform for download in electronic form to your iPad. The good news is that Sequential are making this available free of charge. So you can fill your digital boots via the SEQUENTIAL iPad app here. This may also very well be my first digital comic – certainly the first digital-only one. (I was unable to ascertain whether my Bart Simpson’s Treehouse of Horror strip “From Hell and Back” is - or has been - available in electronic form). You may ask, why after only three years or so since my book Alan Moore: Storyteller, do I feel the need to retread this same territory again? You may also ask, why make it available only as an electronic version? The answer to both the questions is that because Russell Willis of Panel 9’s Sequential asked me to do so. At first I resisted, having already turned down a couple of similar offers during the course of the preceding decade, but Russell won me over because he treated me like a professional and offered me money. I was looking for some new freelance work, and I was also looking to undertake more comics-related projects, so this seemed like a reasonable solution for all parties involved. I do apologise to those who have no iPad and prefer their comics in physical form, but I can totally sympathise as I don’t own one myself either. For the foreseeable future the only way you’ll be able to own this shiny new version is in digital form. But if you haven’t got it already, you physical book lovers can console yourself with a copy of with my own Harvey-nominated, lavish visual biography, Alan Moore:Storyteller, available from all good booksellers. Alternately, if you already have Storyteller or merely can’t get enough of reading about the Magus, there is also a rather lovely new Alan Moore biography which has just been published, MagicWords: The Extraordinary Life of Alan Moore written by Lance Parkin. Parkin was the author of the original Moore biography the AlanMoore: the Pocket Essential Guide (which was the basis for my strip biography for Portrait) so he obviously has the credentials. It’s an exhaustive, scholarly ‘literary biography’ which took the author three years to write and examines a lot of the detail that wasn’t covered in depth in Storyteller. It’s more critical than I was able to be, Parkin clarifies grey areas and sets the record straight in a number of areas. It’s packaged in an exquisite hardcover with spot varnish, belly-band and black-edged pages. 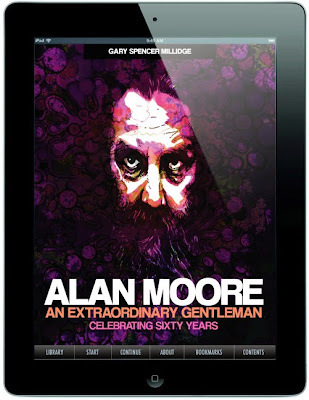 In the meantime, you can download and enjoy, free of charge, the 2013 version of “Alan Moore: An Extraordinary Gentleman” worldwide via the SEQUENTIAL iPad app right here.